roasted mushroom soup…so good… | is there any more pie? Posted on March 3, 2014	by is there any more pie? 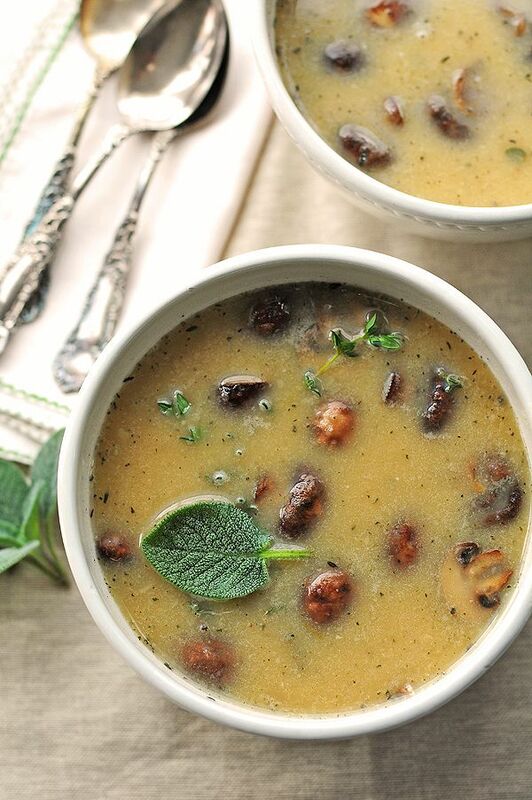 I have to share this Roasted Mushroom Soup recipe with you. I multiplied the ingredients by 1 1/2, and pureed about 80% of the bean/broth mixture in the blender instead of the smaller amount mentioned in the recipe. It’s a Polar Vortex kind of soup, you know? To warm your insides long enough to pretend you still like winter? For some reason I can’t remember, I’d bought a lot of mushrooms. Banjo Man wanted to know what I’d planned to do with them, because he’d bought some too, meaning they must have been on sale somewhere. Of course I couldn’t remember why I’d wanted so many mushrooms. That brain gap sent me to search on Pinterest for a mushroom soup recipe and I quickly found this one. The ingredients are simple: beans, vegetable broth, onions, garlic, mushrooms…and fresh sage leaves. I splurged on the sage leaves, and the flavor was outrageous. Thanks to the “shewearsmanyhats” blog for the fabulous soup. I love soups. Thanks for the recipe. This soup sounds so good – AND it’s vegetarian! Finally – I can have everything! I can’t wait to make it for you!